Released a few fix-it updates to the Better Gmail 2 and Better Flickr Firefox extensions this week, which you can get by pressing the “Find Updates” button in your extensions dialog box. 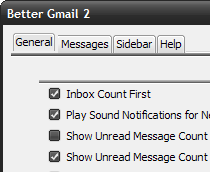 Better Gmail 2 version 1.2 plays catch-up with Google’s latest changes to Gmail: Hide Spam Count now works, and I swapped out Folders4Gmail (which no longer works) with Label Links, a script that does something similar to the Labs version of Nested Labels. Also replaced the CPU-hogging Highlight Rows with Keyboard script with something that does the same thing without the performance hit. Better Flickr also got a much needed once-over, and now doesn’t break editing photo descriptions when Rich Edit Controls are turned on. Enjoy the updates! As always, questions about the extensions should go to the Better Firefox Extensions mailing list. Google redesigned the calendar recently. I don’t like it, so I started to search for add-ons to change the calendar layout manually. I find your Firefox add-on “Better Gcal” but it seams that it doesnÂ´t work. Is it possible for you to simultaneously develop & release better… extensions for Chrome concurrently with Firefox?